Saudia, the flag carrier of Saudi Arabia, is the third-largest airline in the Middle East. Its main hub is Jeddah, with secondary hubs in Riyadh, Dammam, Medina and Abha. The airline flies to 80 countries, including destinations in Europe, Africa, Asia and North America. In the U.S., it flies to Houston, Los Angeles, New York, Orlando and Washington, D.C.
Saudia’s newest planes fly between the U.S. and Saudi Arabia, and customers on these routes often note excellent service and amenities. Among other advantages, these flights offer individual entertainment systems and lie-flat seats in first class. The airline puts extra effort into making its passengers comfortable, even in economy. Every class of service receives amenity kits, food menus and children’s bags with books and games. Even the seats are better. The pitch in economy class is 34 inches, which is among the most generous in the industry. Alfursan, Saudia’s frequent flyer program, offers reasonably priced awards, making it particularly valuable for passengers who frequently fly between the U.S. and the Middle East. Saudia is an Islamic airline with prayer rooms in the back of its planes. No alcohol is served on flights, and the on-board entertainment is often heavily censored. How Can You Use Saudia Alfursan Miles? With the exception of Los Angeles, round-trip award tickets between North America and Saudi Arabia cost 65,000 miles in economy, 140,000 in business and 210,000 in first. Tickets from LA are more expensive, costing 80,000 miles in economy, 170,000 in business and 240,000 in first. Domestic and Gulf flights begin at 20,000 miles per roundtrip. One-way flights can be redeemed for 60 percent of the cost of round-trip tickets. 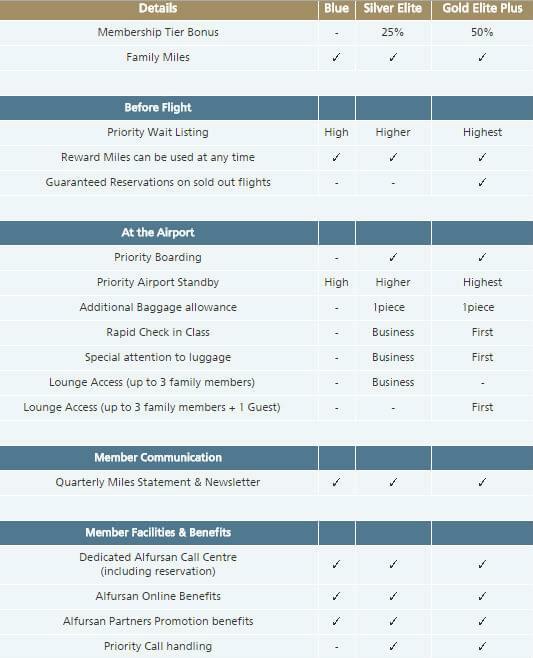 There is a $27 fee for changing or cancelling a domestic award flight, and $67 for international flights. Awards on Saudia can be redeemed on the Alfursan website. Unfortunately, all SkyTeam partners must be booked by phone. 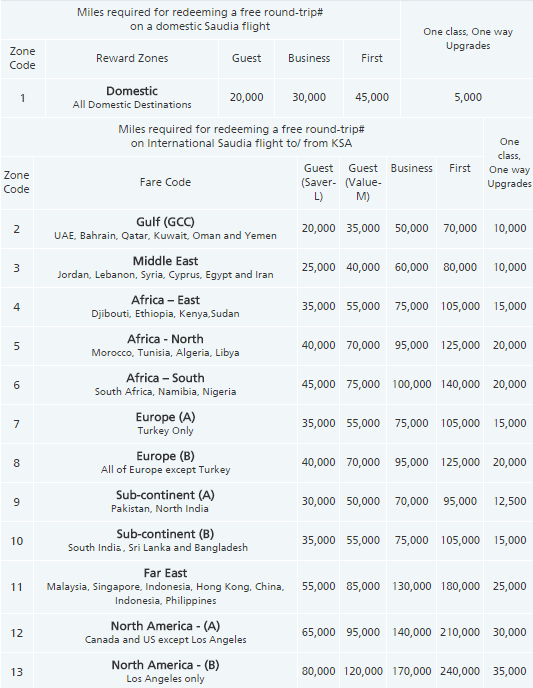 Saudia is planning launch a mileage calculator for award flights. In the meantime, the airline has two separate award charts for flights on SkyTeam carriers: one for travel to Saudi Arabia, and another for the rest of the world. If you do travel to Saudi Arabia, it’s cheaper to fly on Saudia than its partners. The airline has two economy class fares: Guest Saver and Guest Value. The latter is a standard fare ticket. SkyTeam partners do not have this division. You’ll get the most value out of Alfursan miles by redeeming them for economy class flights on SkyTeam partners. It only costs 50,000 miles per roundtrip between the continental U.S. and Europe, excluding Turkey and Russia. U.S.-based airlines typically charge 60,000 miles. Flights between the continental U.S. and South America are another sweet spot in the SkyTeam award chart. Round-trip tickets only cost 45,000 miles. And you can fly from Hawaii to Australia or New Zealand for only 40,000 miles. Unfortunately, the Alfursan charts do not have many outstanding deals for premium cabins. One of the best values for first class is flying on Saudia between the U.S. and India. Those tickets range from 120,000 to 135,000 miles roundtrip. The best business class redemption is a 90,000-mile award seat between the continental U.S. and South America. Most Alfursan premium class redemptions are expensive. One of the worst awards is first class between the U.S. and Australia for 300,000 miles. You can use miles to upgrade cash tickets one class. A domestic upgrade costs 5,000 miles. Upgrades on flights between North America (except LA) and Saudi Arabia cost 30,000 miles one-way. Saudia does not currently offer a co-branded credit card for U.S. residents.